Having a pool in your backyard is a wonderful way to cool off and relax on a hot summer’s day. And, a spa or hot tub can be enjoyed year-round in any climate. However, regular maintenance is necessary to keep the pool or spa water sparkling clean. The two most popular sanitizing options are chlorine 1 and bromine. Which one is right for you? We present the pros and cons of each so that you can make an informed decision. Chlorine and bromine work in different ways to sanitize your pool water. Chlorine is both an oxidizer and sanitizer. When chlorine is added to the pool water in a shock treatment, it quickly combines with the bacteria and kills it and is then largely burned up and eliminated by the filters. You will need to add chlorine every other day or so. On the other hand, bromine is only a sanitizer. It takes longer to activate once it is added to the water, but it remains active even after it kills the bacteria. This means that you may only need to add bromine once a week. Chlorine can be applied in three different ways: granules, liquid, or tablets. The granules or liquid can be added directly to the water without any specialized equipment, while the tablets are placed in a floating dispenser to maintain adequate levels of chlorine in the water. Bromine, however, is best dispensed through a floating feeder or cartridge dispenser, which adds to the initial cost of using bromine. One application of bromine can last up to a week, while chlorine needs to be added every other day or so. A 20,000-gallon pool used year-round will cost about $600 annually to sanitize with chlorine. If you use tablets, you must spend around $20 for a floating feeder to dispense the chlorine. 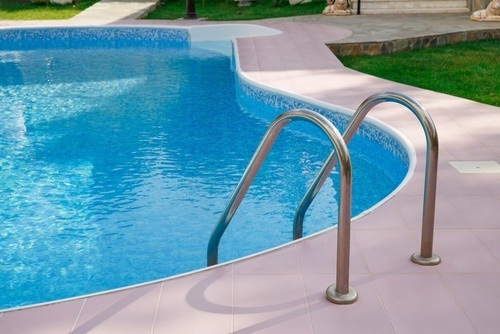 The same pool maintained with bromine will cost about $1,000 a year for pool chemicals. In addition, you may have to spend from $150 to $400 on the installation of a bromine feeder. Cost is not the only factor to take into account when deciding between chlorine and bromine for your pool or spa. Bromine is much better for people with sensitivities because it is much less irritating to both skin and eyes. However, if an allergy to chlorine is an issue, bromine will not work either because it is also chlorine-based. The only options left are a peroxide-based system or silver or copper-based ion generators. Bromine does not emit the same strong chlorine smell like chlorine, but the same stability that keeps it active for up to a week in your pool or spa water makes the odor it has harder to rinse off your skin after a swim. An outdoor pool is inevitably going to be in the direct sun, and both chlorine and bromine break down easily when exposed to UV rays. However, chlorine can be stabilized with a conditioner to keep it working, but there is nothing that can stabilize bromine. This makes bromine a better choice for an indoor pool or spa. Bromine works better at higher temperatures than chlorine. Above 75°F, bromine remains stable, whereas chlorine is more effective in temperatures as low as 65°F. This makes bromine a better choice for hot tubs and spas, and an unheated pool will be better served by the use of chlorine. Chlorine oxidizes when it is working, removing not only bacteria but also organic matter such as body oils from the water. This helps keep the pool water sparkling clear. Bromine’s lower pH makes it less efficient at removing organic debris, leading to a cloudier appearance. It will need an occasional shock with chlorine to keep the water as clean as possible. 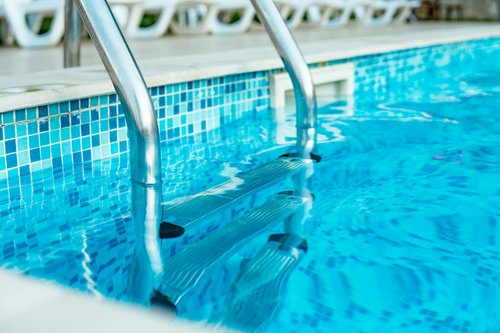 In the end, you have to weigh not just the cost but also the ease of use and health issues when deciding between chlorine and bromine as the sanitizer for your pool or spa. How much does it cost to use chlorine or bromine for your pool. in my city? Cost to use chlorine or bromine for your pool. varies greatly by region (and even by zip code). To get free estimates from local contractors, please indicate yours.